I’m not sure what it was exactly that flipped my internal “switch” about the Nintendo Switch console, but at some point between when they became available to preorder and the release date, the Switch went from a curiosity-piquing concept to something I needed to seek out and purchase. It might have been the parent in me thinking about how useful the parental controls may be, now that my geekling is showing an interest in video games. It may have been the design geek in me appreciating the uniqueness of the controller. It also could very well have been a primal instinct, urging me to engage in the hunt. The Switch console in “handheld mode”—undocked and ready to play! The Switch console is the size of a small tablet, and can be either used separately or docked with a larger television. It comes with one pair of Joy-Cons (aka, the controllers), which can be combined into a large single player controller, attached to the console to turn the Switch into a portable gaming system, or used separately to allow for two players. Once you get into the realm of extra accessories—such as the Pro Controller or a second pair of Joy-Cons—the total number of possible combinations gets pretty large. Getting to the meat of it, is the Switch more gimmick than gaming console? After a few weeks of use, I’ll admit that I’m finding the variable controller and console configurations to be convenient. If my husband has the Twins game on, but I’m feeling an urge to run around Hyrule, we don’t have to start negotiations over the TV. I can start up the game in handheld mode, and then dock the console and continue playing on the TV when the baseball game is over, without having to shut down The Legend of Zelda (or change the Switch output settings—the system automatically does that). It’s handy. We were also able to take and use it on vacation with minimal hassle. The Switch, docked for use with the TV. This is also how the Joy-Cons and console are charged, without purchasing other accessories. When it comes to games where it’s more fun with more people—like Mario Kart 8—being able to have one single player controller turn into two separate controllers is also handy. Extra controllers are expensive, and it’s more fun to engage in friendly trash talk with real people, so not having to maintain a stash of three extra controllers is convenient (an extra set of Joy-Cons currently has a list price of $79.99). 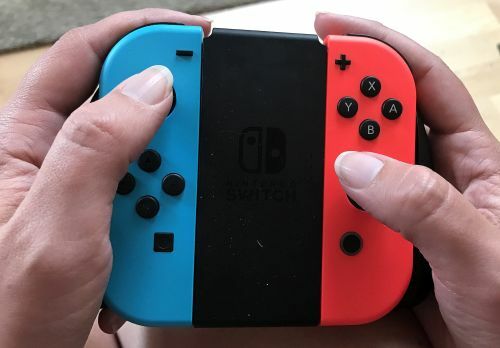 The downside, though, is that while a single Joy-Con is the perfect size for little fingers, those with longer fingers may find it a little awkward to use. In our experience, while the smaller controllers worked perfectly for a group of small cousins engaging in a friendly, familial Mario Kart battle, any adults switching in found their fingers tiring earlier than expected. 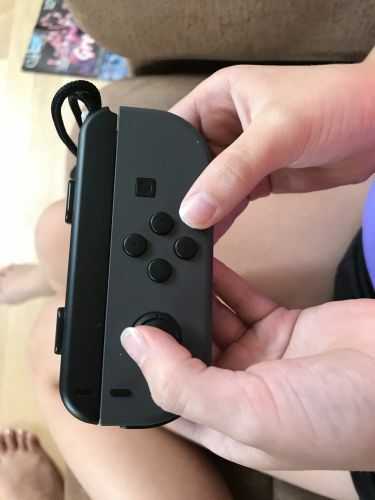 A single Joy-Con is perfectly sized for five-year-old fingers! Adult fingers will find sliding the Joy-Con controllers into the included grip to be much more comfortable. The Switch isn’t going to be a console that replaces either the PlayStation 4 or Xbox One, but that’s been true of all the Nintendo consoles from the past 15 years or so. There’s some crossover of games between the three systems, but one of Nintendo’s strong points is its unique library. While Nintendo hasn’t released specific details on the Switch’s processor (the technical specs list it as a NVIDIA Custom Tegra processor), the internet consensus seems to be that it’s the least powerful of the three consoles. Least powerful doesn’t mean inadequate, though. I’ve spent a decent amount of time playing through the open world of The Legend of Zelda: Breath of the Wild, and the visual distance and details are impressive. The Switch also has less internal storage than the other two consoles, but it can be expanded with Micro SD cards. Is the Switch worth it? If you have kids, have to negotiate for use of the TV, or are a fan of Nintendo exclusive games, it’s great! At a list price of $299.99, the Switch is comparable in price to an Xbox One S or PlayStation 4 Slim. Be warned that it doesn’t come packed with a game, though. Don’t sneeze, or you’ll never be able to find your game! 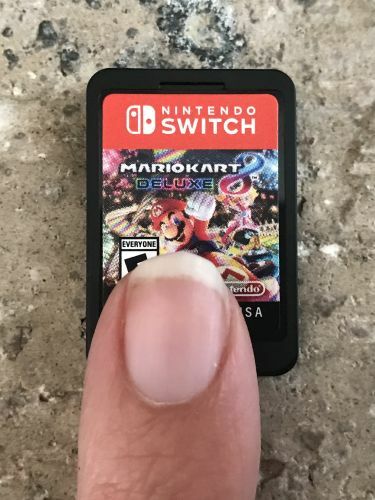 The Switch game cards are teeny! The packaged parental controls are of varying use. Having an app that can be installed on another device—such as a smart phone—is handy, especially if you want to be able to track the usage of your system. From the app you can see the number of hours played each day, which games were played and for how long, and set restrictions on play time and content. The problem, though, is that while you can set up multiple user profiles on a single Switch, you can’t break its usage down by profile. The play time warning can also be easily ignored by the person using the console, so while the Switch will alert the player that their time is up, it won’t enforce the limit. 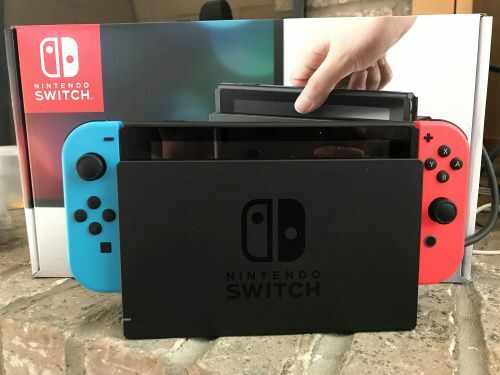 Scarcity seems to be Nintendo’s MO these days, and with the authorized sellers of the Switch currently limited to only six retailers, you just need to hope that the odds are ever in your favor (unless you’ve decided to go the route of finding a reseller, in which case you’ll need extra money, as well as that luck). Finding one isn’t impossible, though. Various websites that track inventory may be of help (I had good luck with istocknow.com), though nothing replaces the time-tested method of nicely chatting up the employees of your store of choice. They’re the most likely to know when their shipments arrive.